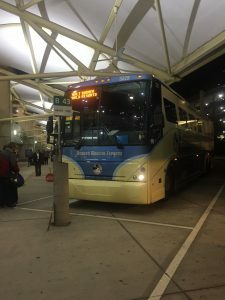 If you are someone who is going to be using Disney’s Magical Express when visiting Walt Disney World this holiday season, you are going to want to take notice of an important update. Due to security enhancements from the Transportation Security Administration (TSA), Orlando International Airport (otherwise known as MCO) has updated their advisory times and is recommending that travelers arrive at the airport earlier than they previously were supposed to. Guests flying out of MCO are now supposed arrive at least three hours prior to their scheduled departure time. This means that there is now a change in the departure times for Disney Magical Express resort motorcoaches. Disney’s Magical Express will now be scheduled to pick up Guests approximately four hours prior their scheduled flight departure time for both domestic and international flights. This means that Guests may have a motorcoach departure time ranging anywhere from 3 hours and 45 minutes prior to flight time, to 4 hours and 15 minutes prior to flight time. This change has been enacted so that it will ensure the Guest’s luggage arrives at the aircraft in time for their scheduled flight departure time. In addition, Guests using the Resort Airline Check-in service must now check in for their flight at least four hours prior to their scheduled departure time. Also, the Resort Airline Check-in desks at Walt Disney World Resort hotels will operate 4:00 a.m. – 12:00 p.m. daily. Keep in mind that this is currently only a temporary measure. The Walt Disney World Resort is working closely with Orlando International Airport. This process is currently expected to be in place through early January 2018. After leaving MCO last Wednesday evening (which seems like it should be a fairly lighter travel time), I was amazed by how long the lines were – it took over an hour to go through security and they were not having us remove shoes or take any electronics out of bags. They really need to look at better long term solutions at this airport, since Orlando will continue to grow and they can’t adequately support that many travelers. OR, for those feeling gutsy, you can always just tell Magical Express that you’re on a flight that leaves 90 minutes after your actual flight does. You can do this and still use resort airline check-in, since they operate as separate services. We just experienced this over the weekend. We were given a 4 hour ahead bus and “missed” our assigned bus and got on one that was 30 minutes later, and STILL spent 2.5 hours at the gate. MCO tells people to get there 3 hours early but when Disney has already sent your bags ahead and you have precheck, it just makes this 4 hour system ridiculous.